TwitterÂ has huge userbase and as a newbie Twitter user, it is very difficult to find Twitter users with similar interests. This problem is also with intermediate (and some vintage Twitter users) – WeFollow can be possible solution to such problem. 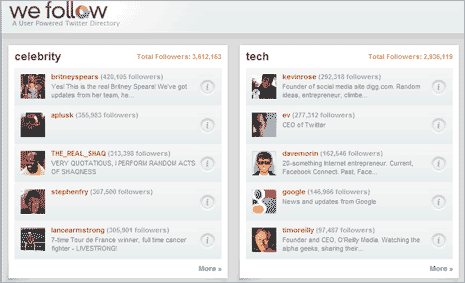 It is a user powered Twitter directory that neatly lists Twitter users under different categories. Homepage has top notch twitter users from categories like: celebrity, tech, social media, science, blogging, news and much more. You can click on i button next to any Twitter user to see details like website URL, tags and latest tweet. There is even top 100 tweeters list on the right sidebar. Any Twitter user can get listed in this user powered directory. Just send a tweet like: @wefollow #yourtag #yourtag #yourtag [where yourtag are keywords explaining your website]. Alternatively, you can click ‘Add yourself’ button on WeFollow homepage to get listed. Looks impressive and very organized – still exploring!